Every church our team works with consistently asks what they should do next. It is hard to have it all figured out. Pastoral ministry is tough. Maybe you don’t know what to do next yourself. Pastors often find the concept of vision clarity and strategic planning exhausting. So, pastors ask us what they can do as they are preparing for strategic planning in the church. Why is that? Why haven’t pastors been better prepared to walk through the process? Why didn’t someone provide the training in seminary to develop a strategic plan for your church? How come vision clarity seems so elusive for so many churches? 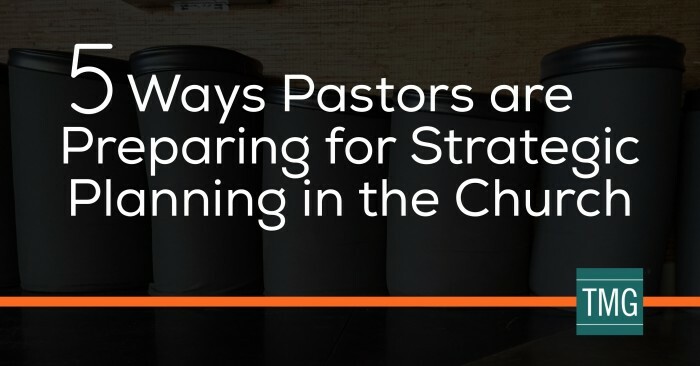 I doubt I’ll answer all of those questions here, but we do want to give you some clear next steps other pastors take as they are preparing for strategic planning in the church. If you were trained to preach expository messages, you may cringe at the thought of a topical series on Christian leadership. After all, there isn’t a book of the Bible called Leadership or Christian Leadership that you can preach through verse by verse, in order to give a systematic theology of Christian leadership. But if you look thematically through Scripture, you will find countless examples of solid leadership and also failures in leadership. Take a few weeks to preach on the need for strategic thinking in the life of the church. You will find that strategic thinking is more about faithful stewardship of the time, talents, and treasure you have been entrusted with than it is about applying a business world concept to the church. You could actually make the argument that the business world has stolen most of the solid strategic examples from Scripture and applied them to their businesses. You will find that God is strategic. Take a look at the example of Paul and the locations he visited in the New Testament. Look at the men of Issachar. Look at what Scripture teaches about finances. Look at Jesus’ approach and teachings on discipleship. All of these will provide powerful examples of strategic thinking that may help you to prime the pump for your church as it gets ready to form its Vision Team and clarify its 2020 vision. All strategic planning should find its roots in a spiritual conviction that it is what God is leading your church to do. All strategic planning should continuously center around the leading of the Holy Spirit and not simply good organizational practices. Take your leaders on a day trip to a retreat center, to your home, another leader’s home, or a nearby lake to spend focused time seeking God’s direction. In an ideal world, you and your leaders should be convinced that everything you do (including strategic planning) is due to the prompting of the Holy Spirit in your hearts to focus your ministry, clarify vision, and engage in multiplying disciples in your church and community. Like most pastors, you have likely not received in-depth training in how to reorganize and re-envision your church. In our experience, not many pastors and churches have. As you look to bring in an outside church consultant or church vision navigator you will likely incur significant costs. How do you plan to pay for the outside help and process? Do you need to initiate discussions now to include church consulting as a line item in your budget for next year? As you look to discern how to cover the cost, you will likely find that one or more of these sources of funding can greatly help: general budget, outside grants, denominational funds, key individuals looking to make a long-term impact through a large gift, individual donations from members of your vision team, funds from a recent project or capital campaign, unused funds from the previous year, or even adding a new line item in your budget where your church takes a faith step. Those are not all the possible financial sources to cover the cost of the envisioning process…you may find others that fit your context better. But the reality is that you will want to think through how to cover the costs before engaging in the process. Your church, like every church, has key leaders that have official roles, as well as other leaders who have an important voice but lack an official role. Each of these groups are important to the process and the viability of moving forward as a church towards creating a strategic plan for your ministry. Who are the people who will likely resist working with an outside organization? You know who these people are. They are people that often question what you do and can easily derail the process. You may have had a conflict with them in the past that you unfortunately left unresolved and now has put you in a position of uncertainty regarding their support of where you lead the church. What do you need to do to engage them in the planning before starting the process? But not all leaders will question everything you do. Some leaders genuinely support almost all of the ministry of your church and will communicate on your behalf to the church. The last thing you want to do is lead the church through a strategic planning process on your own without the support of key leaders and their influence among people in your church. If you aren’t sure who your key leaders are or haven’t organized a process for developing them, you may want to follow these steps to building a leadership pipeline in your church and beware of these church leadership pipeline challenges along the way. Have you stopped to ask your leaders what their thoughts are? When do you plan to meet with these leaders? How could you begin preparing their hearts for the path forward, so that you don’t surprise them with announcements later? You shouldn’t try to manipulate people or control the process. It is under God’s control. But part of pastoral leadership, as you well know, is investing in key leaders that will not only help initiate the process, walk through the strategic planning process, and communicate the process, but also serve as critical leaders in the implementation and/or execution of your strategic operations plan in the days ahead. Anyone who has helped with strategic planning for churches can tell you that six months of outside consulting won’t transform your church without solid leadership. You won’t suddenly become a strategic leader and disciple maker after working with a consultant. Your people won’t either. They need to see you–the pastor–begin making more strategic decisions as you approach your ministry in different ways. The questions is: how will you model strategic leadership for your church? You probably don’t know all the answers to that question. But I bet you do know a few things you could begin doing, stop doing, or alter your approach to how you have been doing them. As I coach pastors in churches of all sizes, I find that virtually every pastor would like to delegate more. Many of them are simply waiting to be challenged to start delegating more effectively NOW. Does that describe you? How do you keep yourself accountable to delegate consistently, in order to do what only you can do? How can you equip and train other growing Christian leaders in your church? What about discipleship? Who are you discipling? Can you easily name the 2-5 people you are investing in individually in a discipleship relationship? I’m not talking about taking them through a program that lasts 6 weeks, 6 months, or some other pre-defined time period. I’m talking about consistent, life-on-life discipleship. If you aren’t growing both as a disciple and discipling others, it is unlikely that a strategic planning process, a new program, or other endeavor will change your church very much. What else do you need to do to get prepared for vision clarity this year? Has your vision become stagnant and irrelevant to your church? I certainly hope not. But if it has, don’t abandon the need to lead more intentionally, clarify a new vision for the future, and prioritize your strategic plan for this year and the coming years. We find that most churches need to return to their strategic plan over time in order to make changes. If this is your church, you’ll find that our process called Strategy Direct may better serve your needs with 3 months of assessment, planning, and implementation rather than a full 6-7 month strategic envisioning process. However, if you haven’t engaged in an intentional strategic planning process in a few years, in 5-10 years, or if you have never done so, now is likely the time for you to start addressing these five areas of preparation for the process. Our hope is that you plan well for the process, regardless of who you bring in to help your church navigate the vision clarity and strategic planning process for your church. May God give you clarity for how to make this year not only a year of preparation, but also a year of intentional planning to maximize the impact of your church now and into the future.